After From Vault to Data Shortcuts v2.0 (2012 Version) I guess it's time for From Vault to Data Shortcuts v3.0. All you vault users probably realized that one very important project.xml file is not there anymore. It has been replaced by more robust .c3dData files. This switch basically made our previous version v2.0 obsolete. Thanks to Matt Kolberg who asked this question and a little push from our own Eddie Ng, I can now release the new workflow to allow you to convert Vault Projects to Data Shortcuts. Maybe conversion is a bit strong word, since it is not converting Vault project per se, but its copy, but you get the point. The same applies in case you received your Vault project as a ZIP file and would like to continue using its data as Data Shortcuts.This is how you can convert your Vault project into Data Shortcuts. Your project will now show _Shortcut folder which we need to tell program it's Civil Data Shortcut project. The easiest test is just to switch profile view style and see if the values do update. If they - do then continue reading for solution. Likely, the issue is due to style not being set to show Station Values for Tick Label Style. To resolve it go to Profile View Style's Horizontal Axes his Tick label text was set to "Raw Stations" (or anything else other than "Station Value". In a continuing effort to provide high quality products, Autodesk has released Autodesk® AutoCAD® Civil 3D® 2014 Service Pack 2, which fixes or addresses a variety of issues discovered by Autodesk's internal testing team and by customers using the Customer Error Reporting Utility. Please check readme to get installation help and to get familiar with updates. The Autodesk® AutoCAD® Civil 3D® 2014 Service Pack 2 can be installed from here. It’s true that there is a very large number of system variables and settings that are not easy to find. One of those is the one that controls the limit of how many objects can be selected at the time. Typically you would hear or notice something along these lines: "When I pick an item with the Properties task bar open, at the top I see "No Selection" even though the items on the screen shows as selected." The problem here is that the Properties dialog recognizes objects, but users cannot change color, layer, etc. this way. This is all because in AutoCAD there is a maximum number of entities that can be selected before the properties palette registers "No selection". There is a property limit system variable PROPOBJLIMIT that controls that. By default it is set to 25000. The upper limit is 32767 (2^15) (16-bit). 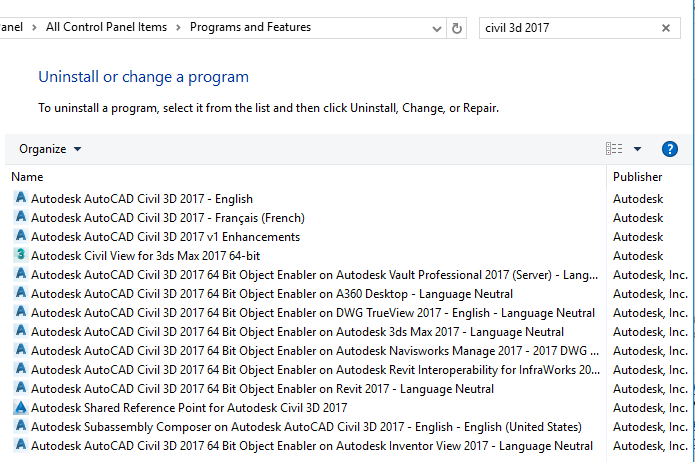 In a continuing effort to provide high quality products, Autodesk has released this hotfix which solves a Vault Add-in for AutoCAD Civil 3D issue where Civil 3D will close with Unhandled Exception on startup if Autodesk Vault 2014 Subscription Release 1 is installed. Please check README file for additional instructions and description of the issue. ArcGIS Connection: How to solve "Create factory failed"
Last week I posted some general information about ArcGIS connections. Coincidentally, a customer was using the ArcGIS Provider that week and experienced a specific issue that, to this point, was undocumented. Here it is, exclusively on Being Civil! This is happening even though you have a valid ESRI license available to you. Note: The file geodatabase can be accessed successfully when opened in ArcMap (meaning the file is not corrupt). Cause: This can happen if the file geodatabase's directory extension is incorrect. Solution: Change the directory name in which files (*.gdbtable) are stored to add suffix ".gdb".